November | 2014 | The Fantastic Flame On! This week, Steve and Andy welcome Emily Middleton of the Relatively Geeky Podcast Network to the show. As the host of Uncovering The Bronze Age, Emily is ideally positioned to help us transition from the 1960s to the 1970s. And, as the daughter of previous guest-host Alan Middleton, she even has our Skype contacts already on her computer! 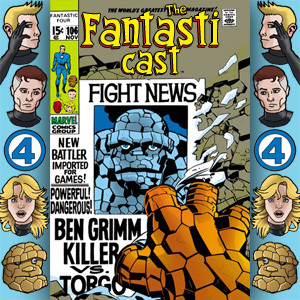 We’re covering a veritable stack of comics this episode. 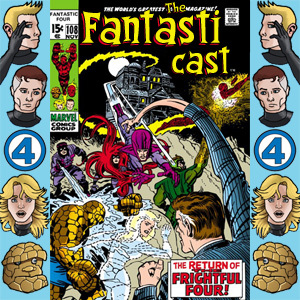 Fantastic Four #94 features the first appearance of Agatha Harkness, the return of the Frightful Four, the naming of the younger Richards, and a very scary cat. We’re also taking a look at Incredible Hulk #123, where Reed is responsible for a big change for Bruce Banner, and Namor, The Sub-Mariner #21, where Ben Grimm records a voicemail message. As well as all of this, we’re also taking a very brief look at our experiences at the recent Thought Bubble convention. Spoiler: It was awesome! OK, we’ve done that joke to death. 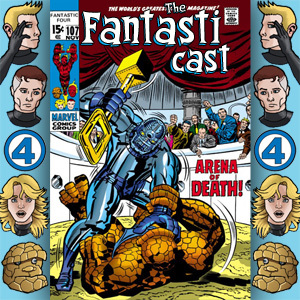 This week sees us tackle Fantastic Four #93 as the saga of The Thing’s enslavement on the gangster world with gladiatorial deathmatches comes to a close. Not necessarily a conclusion, but it certainly stops. Do the Fantastic Four have an actual role to play in the issue? Will the long-promised battle between Torgo and the Thing live up to expectations? And what happens when mobsters start arguing the finer points of the rulebook? We’re also taking a rare side-trip into The Incredible Hulk with issue #122. Reed’s got a cure for the Hulk, and it’s the first Hulk/Thing battle in several years. Herb Trimpe’s on art, and without spoiling too much, this issue is a pleasant surprise. We also examine the contents of the Hulk’s green-skinned grab bag, which is less of a pleasant surprise. It’s Thought Bubble weekend, and Steve and Andy are busy trying to teach comics fans at the Royal Armouries in Leeds how to talk like a 1920s gangster, see? 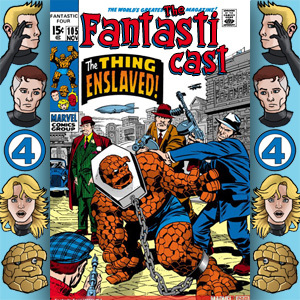 The reason for this is that this week’s episode features covereage of the third (second-and-a-halfth) part of the Thing Enslaved story, in Fantastic Four #92, see? Marvel at the delights of lazily designed and named Magno-Man! Delight at the appearance of Cat Man! No, not that one. Or that one. Thrill at the dropping of a running gag regarding the insertion of the word ‘see’ at the end of each sentence! All this, and the Swindon version of Seal’s greatest hit! 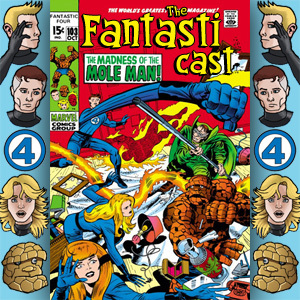 This week on the show, we cover Fantastic Four #89, with its hysterical blindness, and a plot hole so huge and inconsistent that only one of the team picked up on it. Returning this week is Shagg Matthews, of the Fire And Water Podcast and the Who’s Who: A DC Universe Podcast, as well as the brand new Ultraverse Podcast. Check out Andy’s article on the Battlestar Galactica pilot here.